Here are two predictions about the UK labour market for 2016. Banks with swollen cost bases and anaemic growth will lay off tens of thousands of people. And a chronic skills shortage will stop the country from building the houses it needs to offset rising prices. In an ideal world, that means that bankers ought to think about becoming builders. Banks have a problem that isn’t going away. Expenses are too high for returns to exceed costs of equity, especially because once-proud fixed income divisions now have to hold lashings of capital. Almost every bank has launched multi-year cost-reduction programmes: HSBC is cutting up to 25,000 jobs by 2017, Standard Chartered plans 15,000 gross reductions by 2018, while Barclays said in 2014 it would aim for 19,000 by end-2016. In sum these three alone plus Lloyds Banking Group and Deutsche Bank will lay off 77,000 staff, with over a third likely to be in the UK. British homebuilding has the opposite problem. The sector has lost 300,000 workers since 2008 as builders retrained away from a denuded sector. At the very least, it needs to build 80,000 houses a year above the 141,000 it managed in 2014 to keep pace with household formation, according to consultant Arcadis. With the average home having required 1.5 workers annually to get built that implies Britain needs to find at least 120,000 new house builders. It’s sadly unlikely that sharp-suited corporate financiers will suddenly opt for a life of hod-carrying. But the culture clash between life on a construction site and that of a fixed-income trading floor, where the deepest cuts are occurring, may not be so great. 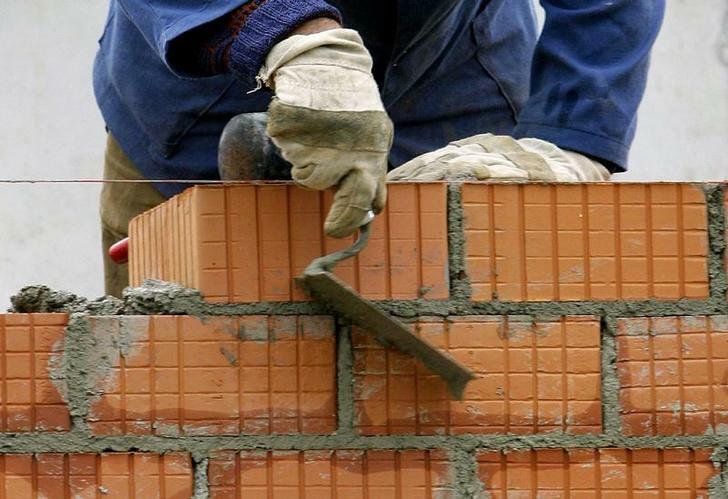 This may even apply to pay: the deficit of bricklayers is sufficiently extreme for skilled tradesmen to be able to demand annual incomes of over 60,000 pounds. By way of comparison, the average compensation for Barclays’ 132,300 employees in 2014 was just over 67,000 pounds, although those facing the chop may be towards the higher end of the scale. Were the UK government minded to bring house prices back under control, it probably would have to publicly fund most of the extra houses needed. That could provide the delicious irony of masters of the universe becoming salaried employees of the state. But if any financial types fancy a pivot into something undeniably socially useful, they should head sitewards. The UK would require 120,000 new construction workers in order to build 230,000 houses a year, consultant Arcadis estimated in June.